Like many others, I was reluctant to take up with the mesh heads as I love my own face, I have worked on it over many years, and mesh heads seemed to be a move toward homogeneity rather than individuality. But I bit the bullet mostly because of some of the amazing make-ups being made for mesh, like the eye-shadow by Elymode, and the lips by Mons that I have on here. Going fully mesh though brings another issue....finding that perfect skin that is compatible with both your mesh body, and mesh head. And brings your look closer to your non-mesh look. 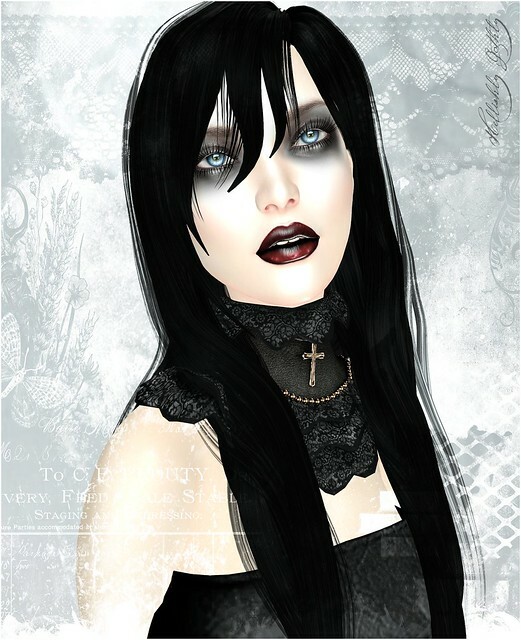 One such Lelutka applier/skin is the one I have on here by YS&YS, and available at Shiny Shabby. The skin is gorgeous. I mean seriously lovely, and with an absolute heap of options in make-ups. But..it is expensive. At 1499L for the applier/skin, I had expected it would include other basic appliers for body/hands/feet. It doesn't. So if you also need a Maitreya Lara applier, and maybe SLINK hands/feet appliers, you need to add another 500L. And that is just one skintone. For me, that is just more than I can justify, which is sad as I was going to buy 2 more of the skintones. As I am showcasing this eye-catching dress by Paper Moon available at The World Goth Fair. The dress is a smart black sheath dress with a striking contrast peplum available in 5 versions and has a colour change HUD. Goth or not, this dress is a great investment for parties/clubs, etc. I've accessorised it with the very goth flavoured collar by Scrub, some ubiquitous fishnets by Bossie, and these very cool bracers by [sYs].